Bismarck, ND (WDAY/WDAZ TV) - Tourists like to soak in the beauty of the region in the summer, but are we attracting visitors from another galaxy? This photo was sent to wdaz.com by a viewer from Bismarck. She cannot identify the object. 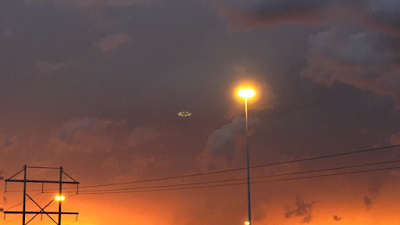 While it certainly looks like a flying saucer, there are several possible explanations. For instance, the image could be a lens flare created by reflected light of car headlights from a nearby roadway. Or Is It A UFO?